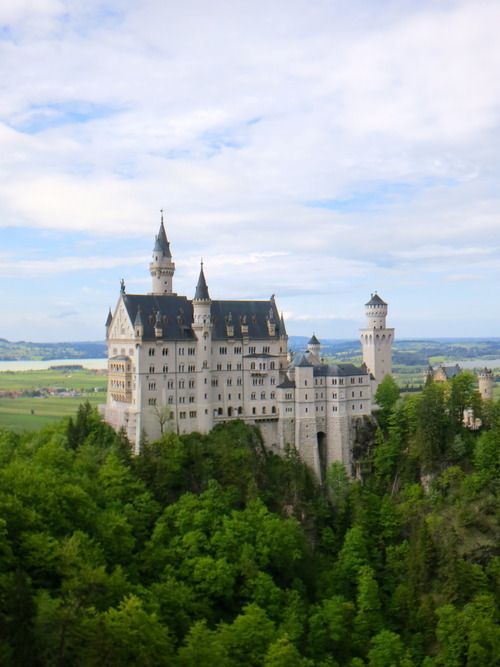 If you are on a budget, you might consider staying at places far from the city center considering Munich is a relatively small city. We stayed at A1 Apartment in Moosach in Zone 3. 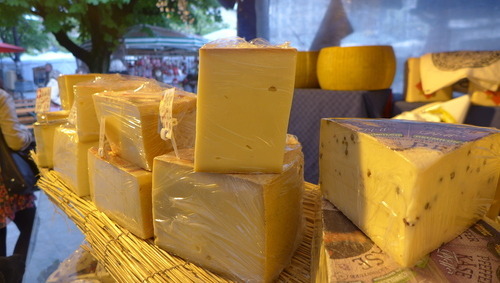 It was a 10-minute walk from the Olympia-Einkaufszentrum U-Bahn station. Since it was a residential area, it was scary walking at night; it felt like Zombieland. There were no people and it was really dark! We had to run at some point. Not bad for PHP2,600/night for two, huh? 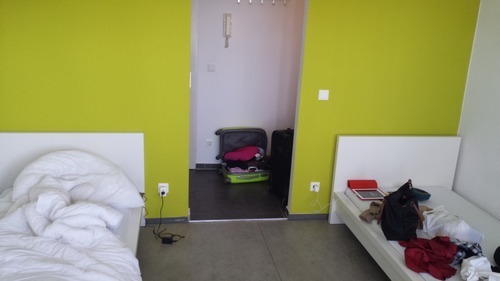 (92,00 EURO) It’s a shared bathroom but it was right across the room and has a balcony and the best part? It’s right beside a supermarket called Norma. We didn’t have the luxury of time in this city so the sites we saw were very limited. However, we pretty much did a lot of things considering the circumstances. 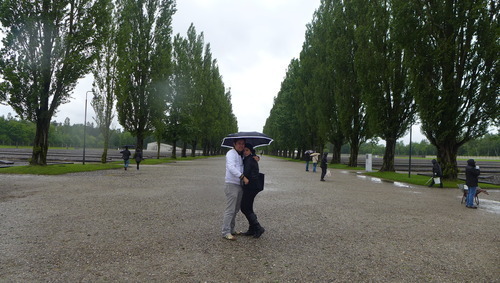 The most famous square of all of Munich. All the metro lines stop in this square. (This is where we met with my cousin, Hanie who we also met in Paris 2 days before) Fresh from the overnight train, we wasted no time and started our day! There’s an information center right in the middle of the square where you can get maps and everything you need to know about the city. 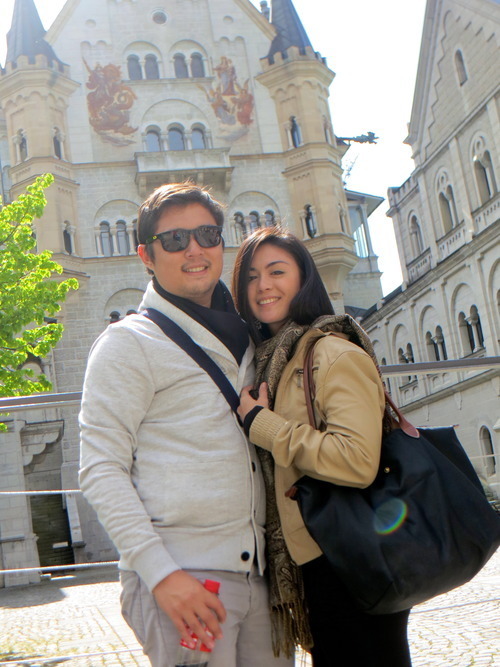 We wanted to go to Neuswanstein Castle but the lady said there was no time so we decided to explore the city. 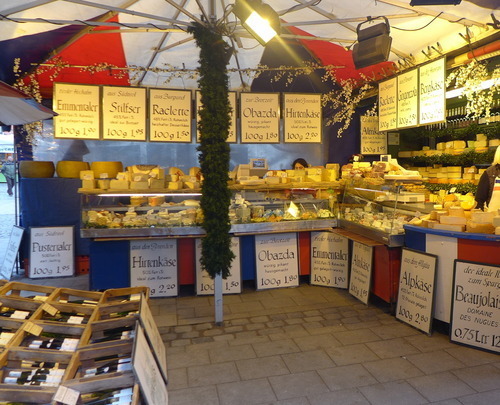 Right beside Marienplatz is this outdoor marketplace that offers all types of cheeses, wines, poultry, local delicacies, fish, meat, fruits, spices and everything else! I could spend an entire afternoon in this place alone. Sadly, the weather didn’t permit us to spend that much time outside. It was raining and freezing! This is what heaven looks like!! 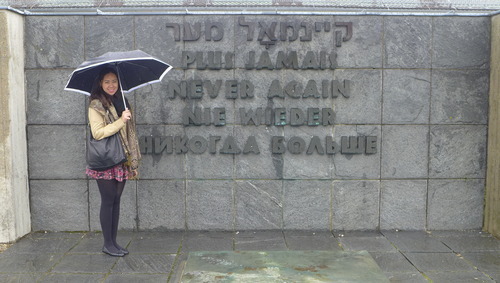 Dachau Concentration Camp Memorial Site. 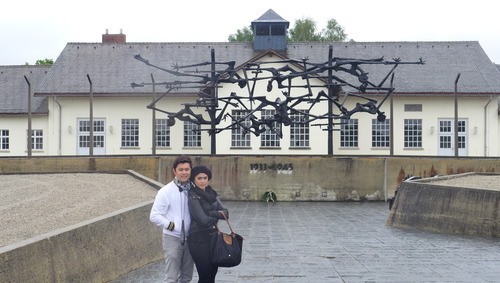 This historic place was a death camp in WWII that’s been preserved and is known today as a place of memory, pilgrimage and education. 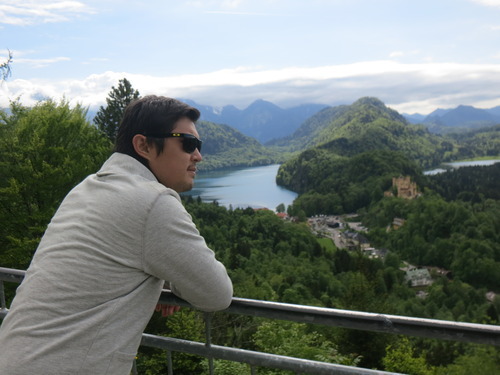 Nik found it appalling to visit a place like this but my fascination of the happenings of WWII outweighed him. The camp is right outside Zone 3 so it’s still covered by the day pass. (TIP: when you ride the bus, just go in right away without hesitation). From the station you have to take a bus that drops you right in front of the camp. This place is absolutely free so no need for any tour. There are information boards in all the rooms that you could read but we were lazy too lazy to do that so we got 1 audio guide for the three of us which cost 7 Euros. 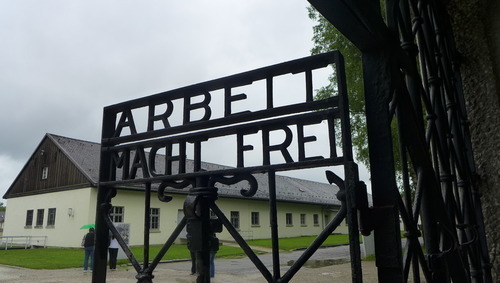 “ARBEIT MACHT FREI” a German phrase meaning “labour makes you free” found at the entrance gates in a most concentration camps during WWII. Most famous one of them is in Auschwitz in Poland. 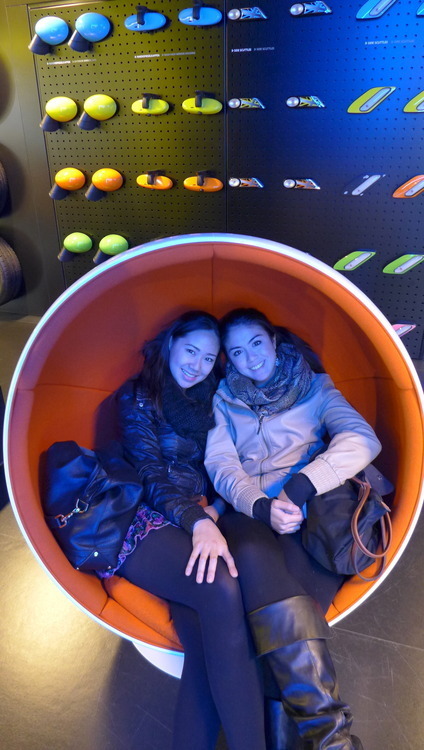 To divert our minds from the very depressing site earlier and to avoid frostbite, we decided to go to the BMW Welt. In my opinion, it looks like an ordinary car dealership. Aren’t I such a lady? But paying attention to details, it was really something! 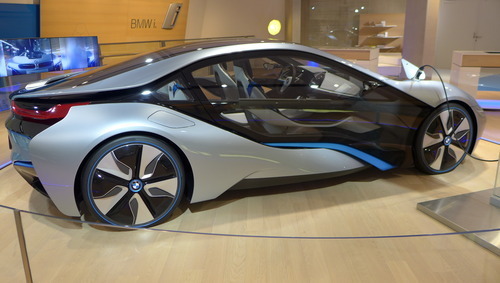 They displayed the latest car models, the history of the company, little games you could play and you get to experience just how electrifying driving a BMW is. Hello Shopping spree!!! 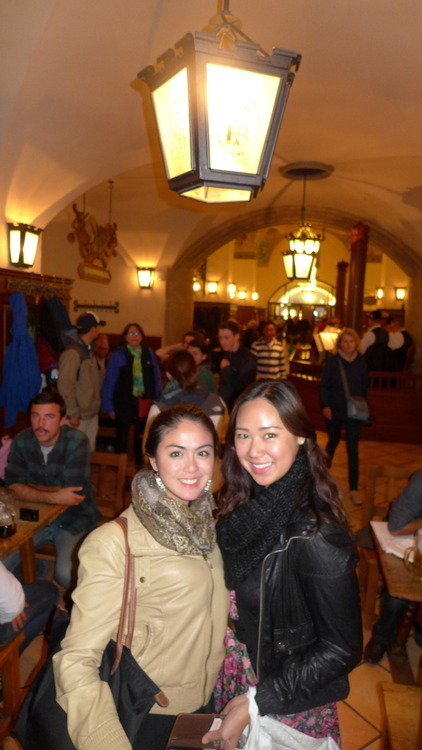 Take the Odeonsplatz stop and make your way to Marienplatz and you will find yourself surrounded by all the shops. 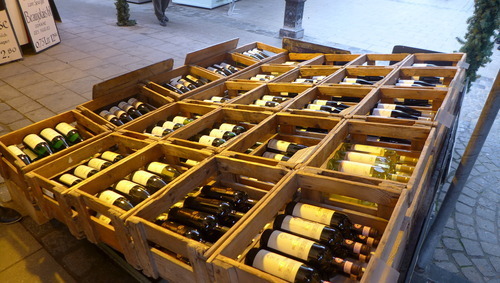 This is the Spagna of Rome and the Champs Elysees of Paris in terms of shopping. Two hours in H&M and 150 EUROS later, we decided to get out of the store to avoid further damage and grab some supper so we walked back to Viklualienmarkt again but to our luck, everything was closed! 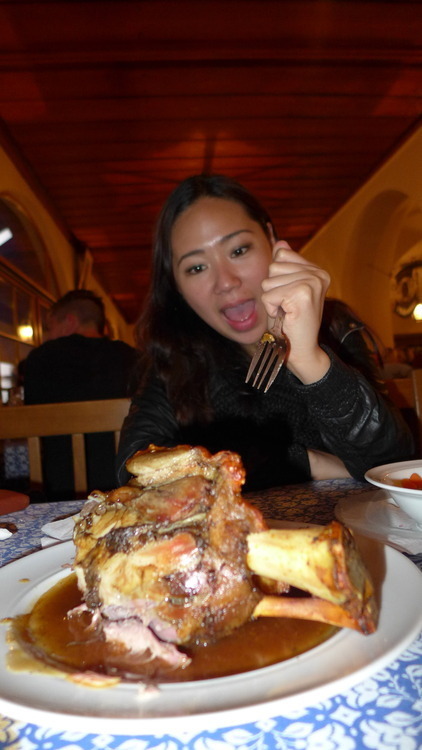 We walked close to an hour looking for a place to eat Munich’s famous dish, the Pork Knuckles but we couldn’t find any! We were starving to the point that Nik and I were arguing on directions and my cousin and I didn’t even talk to anymore and if one said something, a cat-fight would start. We had to ask around! 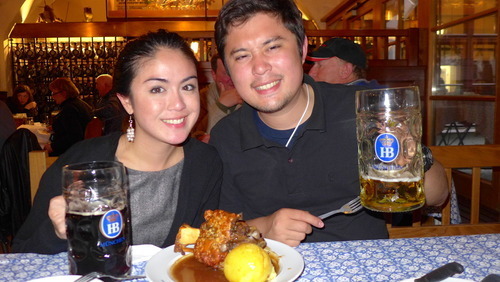 Good thing one local said “HOFBRAUHAUS.” It felt like we died of hunger and reached heaven. What a place! This must have been the best part of the day. 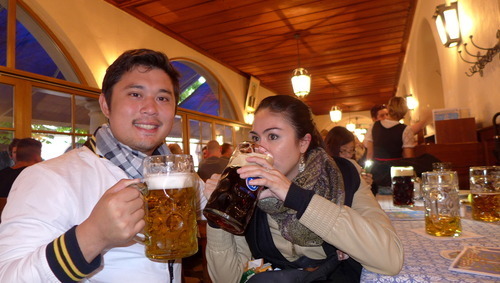 You can’t go to Munich and not experience their very famous beer houses and beer gardens. 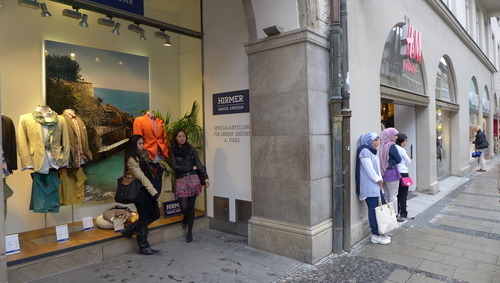 This place is the most famous in all of Munich. We started with 2 “glasses” of Beer. 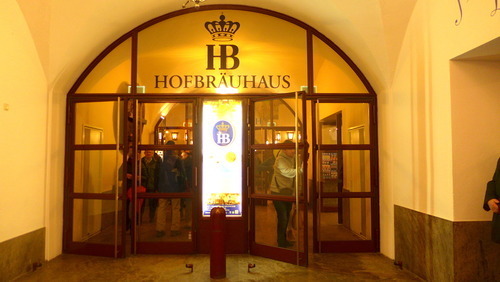 1 Hofbrau Dark Beer and 1 Hofbrau Original. (Mind you 1 “glass” = 1 Liter.) and soup to warm the body and a salad. For the entree’ we had Juicy Brewer of Goulash. And for the most awaited part, we finally had ourCrispy Roasted Knuckle of Pork. Dinner was about 30 Euros for three. Not bad AT ALL! Enjoying my Hofbrau Dark Beer for 7,60 Euro. 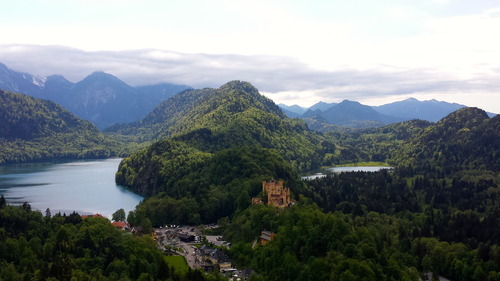 Today we took a day trip to Fussen to see the fairytale castle of the MadKing, Ludwig. 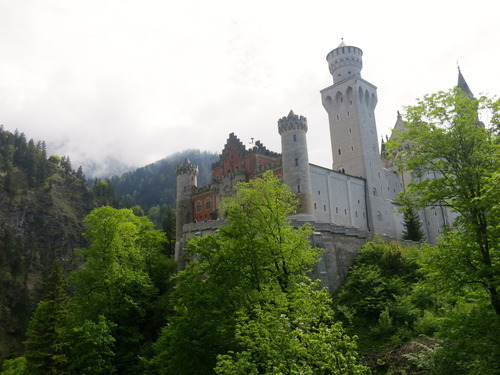 It is said that this castle is the inspiration for the castle in the Disney Movie, Sleeping Beauty. I love all the Disney Movies! I am a sucker for everything “Princessy” and I’ve been dreaming of seeing this specific castle since I was 12 so I didn’t mind that it was late and it was gloomy, I had to see this castle no matter what. How to get to the Castle? We went to Hauptbanhof Station and asked information for tickets to Fussen, The woman gave us an open ticket for the day. We left at exactly 12nn. 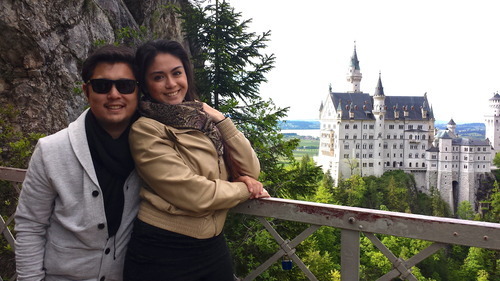 2 hrs later, we arrived at Fussen train station and then we took the bus to the Castle area. 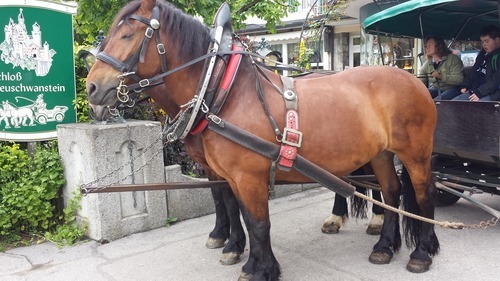 The carriage only takes you below the castle and you have to walk another 15 minutes on a very inclined road that leads you directly outside the castle doors. 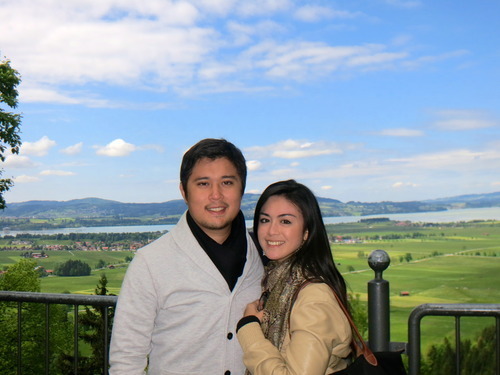 It took us almost 30 minutes to walk because we went in the gift shop and we just had to take photos of the amazing view of Bavaria. We finally made it to the castle with 20 minutes left before our tour so we explored the outside of the castle. 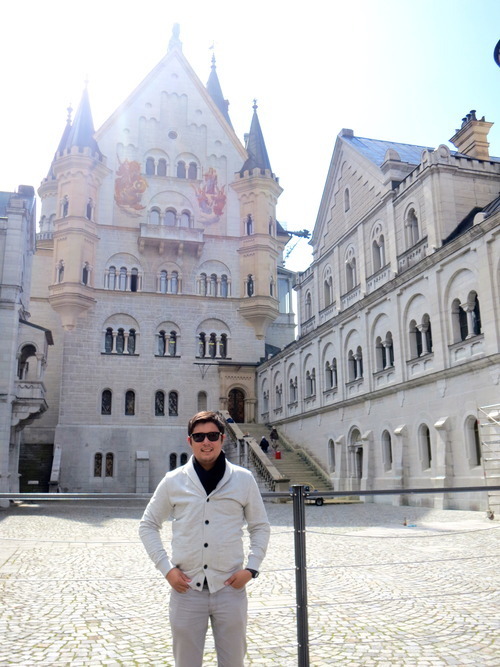 The tour took an hour and it showed us the grand castle! It was like walking in the Beauty and the Beast Castle. It looked exactly like a Disney Castle. It was amazing and indeed the King was mad for imagining building this magnificent castle on top of a cliff. There were no photos allowed in the castle. 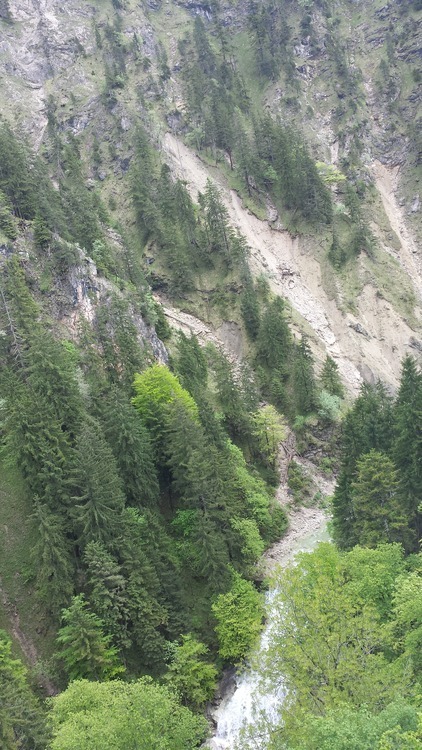 Take another 15 minute walk further up the hill to Marienbruck bridge where you could see the entire castle. It’s a breathtaking view of the 2 castles. We decided to take the pleasing hike down to the bus area but to our surprise, the bus left 2 minutes before and the next bus will be in 30 minutes. 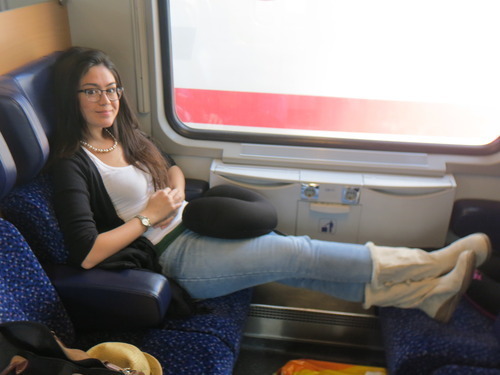 We had to take a cab to the train station and we made right in time for the last direct trip to Munich. 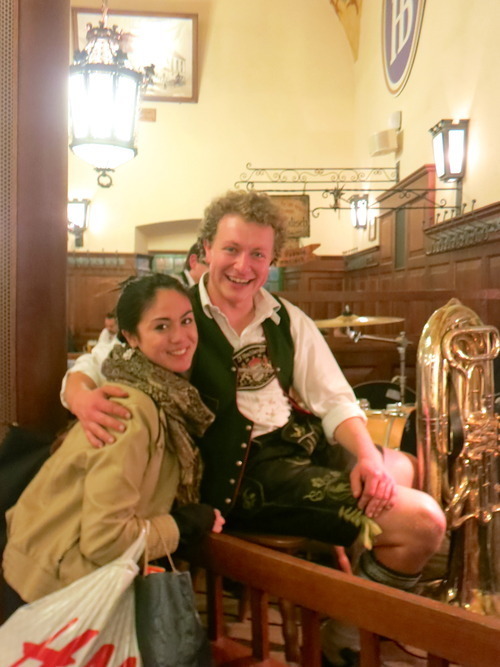 We couldn’t get enough of Hofbrauhaus so we ate there again. Auf wiedersehen, München, Buongiornno, Venezia!